Our team had done the 18th Personal Information Technology workshop at University of Science and Health. 120 participants attended this workshop. These health students seem didn’t know the web 2.0 tools such Blog, Social Networking, Photos Sharing, RSS,… they are very surprise about all this tools that let’s them to communicate, collaborate, sharing and especialy they can expresss their own idea to the world. 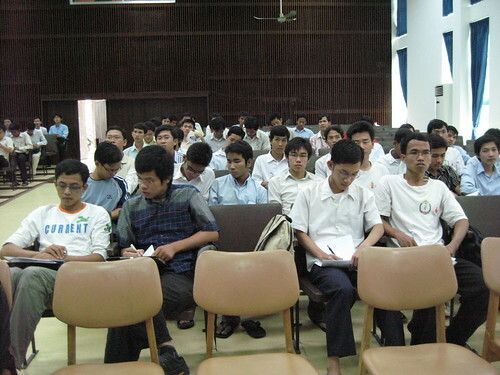 On 11 June 2008, we had done our 17th personal information technology workshop known as blog workshop at Institute of Technology of Cambodia with 125 participations. Participations practiced internet with their own laptop. I would like to inform you that we will conduct 2 Blog Workshop in June. This workshop will present by Clogger Team. Please come and joint the workshop with us. 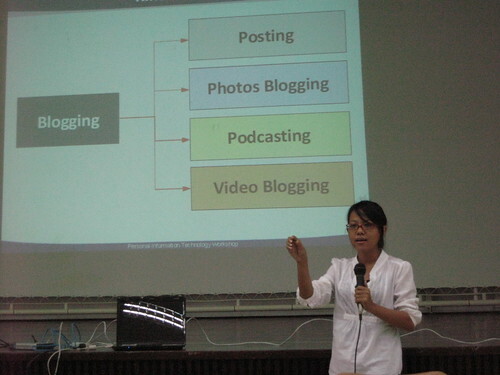 The Cambodia Blogger team will attend the Internet Party 2008 at Sovanna Shopping Center on 23-24 May 2008. I will make the booth and call “The Cloggers Corner”. CloggersCorner was created by volunteers from Cambodia Blogger (aka Clogger) and will joint Internet Party 2008 to contribute and sharing the next generation of ICT and second generation of Internet-base service technology to every participants. And everyone can meet, disuss, learn and practices in our space. Internet Party is an annual event celebrates once a year on every MAY to help promote IT awareness, link Businessman, IT Managers and IT Professional together also promote the use of Technology by encourage student to focused on it. We, Clogger Team would like to invite all of you to join our space (The CloggersCorner) to share your knowledge and your creativity with Cambodia youth, with everyone who participate the internet party 2008. This is the great opportunity that everyone can meet and discuss with some great topics. For more information or if you have something to present please contact me by (855) 12 31 67 81 or be_chantra[@]yahoo[dot]com. On 5th May we had done the personal information technology workshop at Royal School of Administration with 95 participants. The interesting was participants took their own laptop, probably 40 sets. Most of participants who had laptop can create their own blog. We would like to announce that our Clogger team will conduct the Personal Information Technology workshop at ERA (Royal School of Administration) located behind Ministry of Interior on 5th May 2008 at 2:00 pm till 5:00 pm. There will be more than a hundred participants attend this workshop. We hope that this year, we can do with 10 more universities to introduce them the web 2.0 tools and Khmer Unicode. After first PIT workshop has been done at Royal University, the next we will conduct this workshop again at Chenla University on Friday, 15 February 2008, at 2:00 pm. So please feel free to attend this workshop. Please take you Labtop during the workshop to access wireless Internet for free.